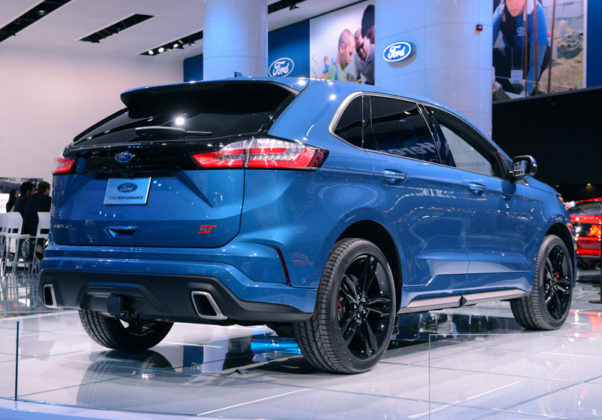 Introduced last January at the North American International Auto Show in Detroit, the 2019 Ford Edge ST is just about ready to hit dealer showrooms. 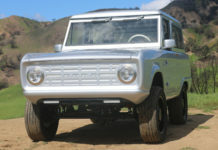 Did the world need a high-performance version of your run-of-the-mill soccer mom mid-size SUV? We’ll see. Are we happy Ford decided that we indeed needed an ST version of the Edge? You’re darn right. Ford built the Edge ST to be worthy on a racetrack while still offering the interior space buyers want from their family SUV. On paper, the Edge ST doesn’t really have much competition which is usually a good thing. It’s not quite as powerful as the Grand Cherokee SRT, but it packs more punch than every other top-trim mid-size sport utility vehicle on the market right now. 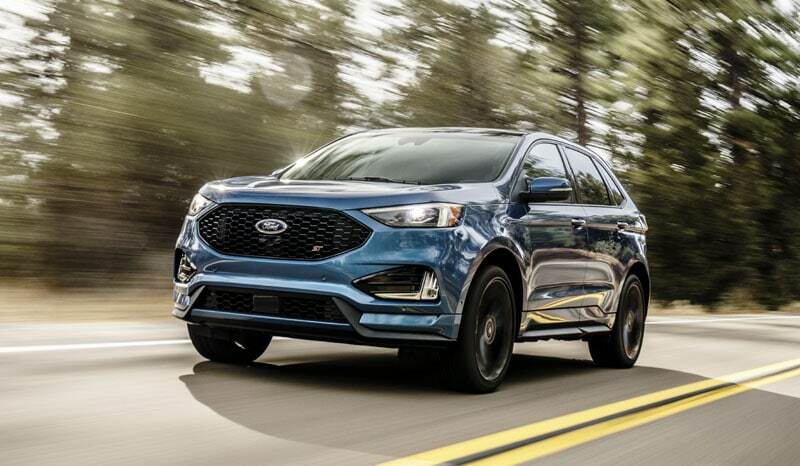 Powered by a 2.7-liter turbocharged EcoBoost V6, the 2019 Ford Edge ST sends 335 horsepower and 380 pound-feet of torque to all four wheels through an 8-speed automatic. Yes, it’s the same engine that called the previous Edge Sport home, but with 20 extra hp and 30 extra pound-feet of torque. The Edge ST also has, well, more edginess to it than the Sport model. Available 21-inch wheels are just the start. Heavily-bolstered front seats keep you in place as you push the sportier suspension to its limit all the while enjoying a more raucous and distinctive exhaust note. 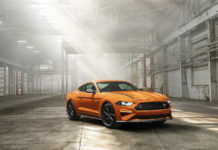 Ford introduced the Edge ST in Detroit with a video showing Hau Thai-Tang, Ford’s executive vice president of Product Development behind the wheel on a track. Complete with smoking tires and drifts, this video drove home the point that the Edge ST is supposed to be a true performance utility vehicle. Being that it can’t match the Grand Cherokee SRT’s 475-horsepower V8 engine but that it will be a lot more dynamic than any other rival by far, the Edge ST may carve out a unique niche for itself. There will be plenty of tech in the new Edge ST as well. An intelligent all-wheel drive system can analyze road and climate conditions as well as how the driver is behaving in order to optimize either stability or fuel economy. 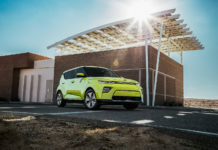 In other words, the system uses sensors that monitor windshield wipers, outside temperature, ABS, and wheel position, and can switch to two-wheel drive when it senses that you don’t need AWD, or vice-versa. 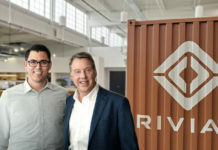 Ford likens its AI all-wheel drive system to checking the weather forecast and your daily schedule before deciding what to wear. 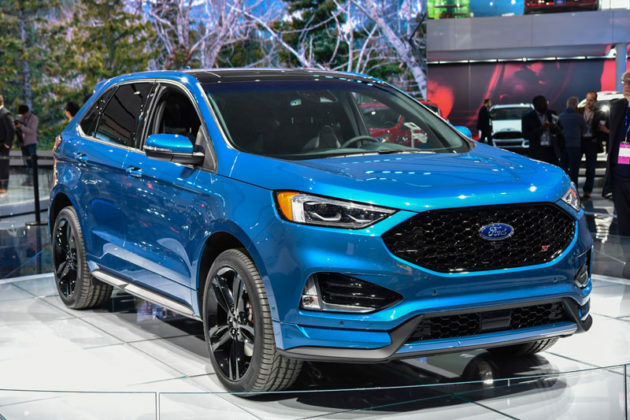 Active grill shutters, deceleration fuel cut-off, stop-start, and exhaust gas recirculation are other features packed into the 2019 Edge that help save fuel. 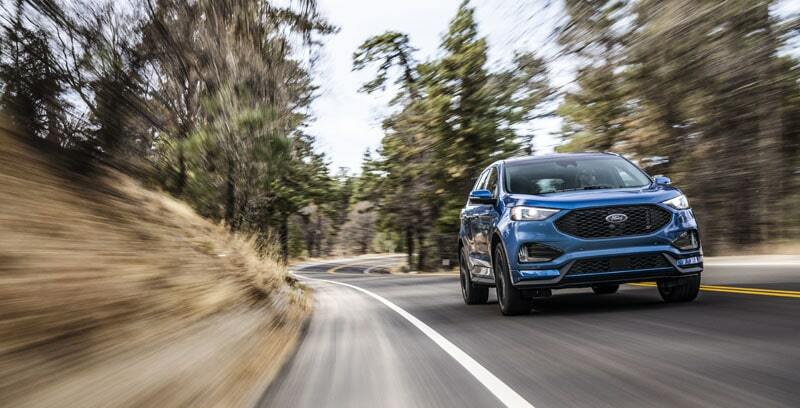 There’s also plenty of safety tech in the 2019 Ford Edge lineup including the ST model. Adaptive cruise control with lane keep assist, pre- and post-collision braking, pedestrian detection with automatic braking, and active steering with collision avoidance are just a few examples. Ford unveiled the 2019 Edge SUV lineup, including the all-new Edge ST performance SUV, at the 2018 North American International Auto Show on Sunday. 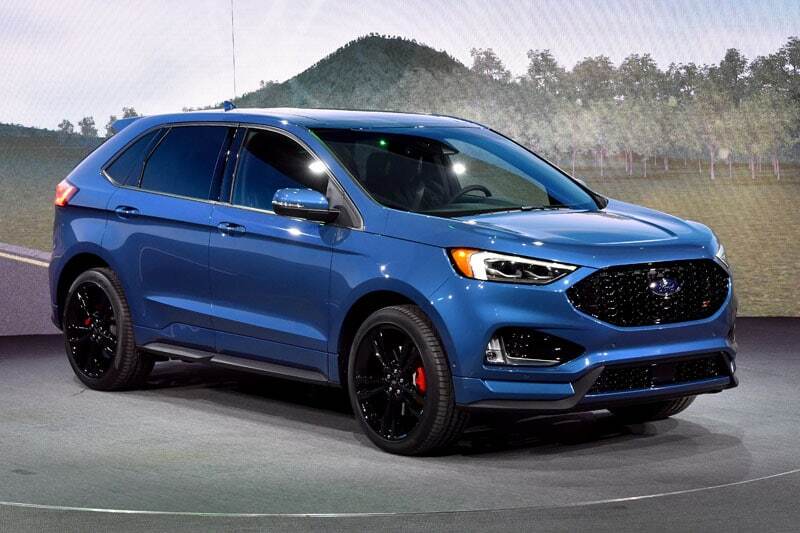 Ford introduced the Edge ST – its first-ever performance SUV – at the North American International Auto Show on Sunday. 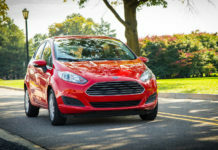 Edge ST is part of a refreshed Edge lineup that offers an assortment of driver-assist technologies, including available technologies such as Evasive Steering Assist, Post-Collision Braking, and Lane Centering. 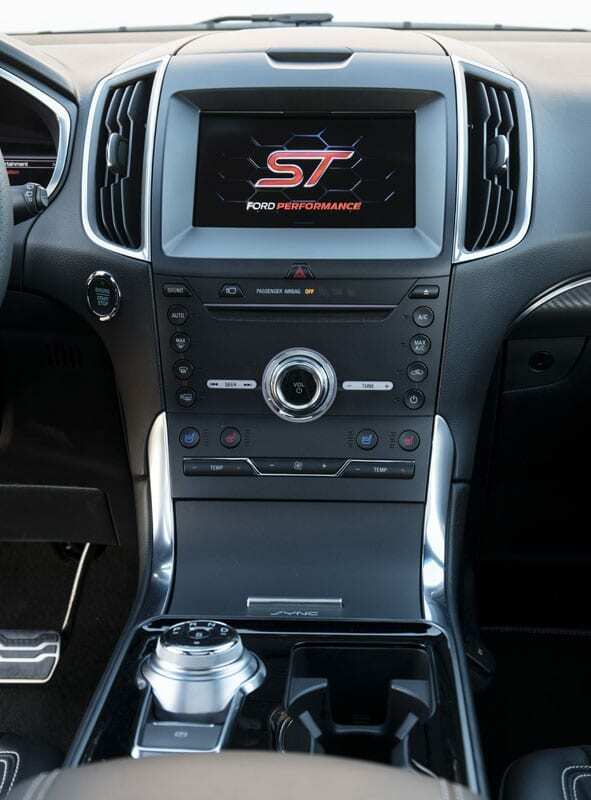 Edge ST features superior handling and braking, ST-tuned sport suspension, Sport Mode, new quick-shifting 8-speed transmission, standard all-wheel-drive, and the most powerful V6 engine in its class. Next articleShould You Buy a 2018 Chevrolet Camaro SS 1LE?